Maida is finely crushed polished and bleached wheat flour. 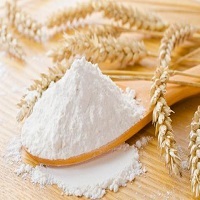 It closely resembles cake flour and is used widely in making bakery products like bread and pastries as well as varieties of sweets and in making traditional Indian breads like paratha, kulcha, naan or rumali roti. Maida is used all over the world for making pizza crust, tortilla and white bread. Maida Flour maybe adulterated with cheap flour. Adulteration of Maida flour cheats the consumer and poses a serious risk to health.